This past Thursday was the most amazing trade deadline in years for us basketball junkies. So much occurred in the 11th hour before the clock hit 3:00 PM EST. Twitter was a tweeting as deals were being reported left and right and everything was coming at us at once. All of this was really hard to digest right away, and still a few days later it’s not entirely clear what every team was thinking. So here’s your guide through what actually went down, and why. The Celtics have been pretty fond of Isaiah Thomas dating back to last off-season. Danny Ainge saw an opening to get him and in exchange gave away one of their many future 1st round picks. The Celtics are the most “un-tanky” of all the “tankiest” teams in the league (those are words now). Boston is really not helping themselves only being bad enough to secure the somewhere around 11th pick in lottery. Suns pick up a future asset and cut their losses with the ill-fated Thomas signing. K.J. McDaniels is on a goofy one year deal and because of his play this year some team is likely to give him an offer sheet that the Sixers aren’t interested in paying. Further, many in Philadelphia are saying that Sam Hinkie doesn’t really want to deal with K.J.’s agent after botching the initial contract negotiations. Plus the Sixers really like Isaiah Canaan and have tracked him since last year’s draft, and now have an obvious void at PG. Houston grabs another wing player who can defend really well and could see minutes in the playoffs. Flip Saunders is a genius, and when I say genius, I mean he makes other GM’s look like geniuses. 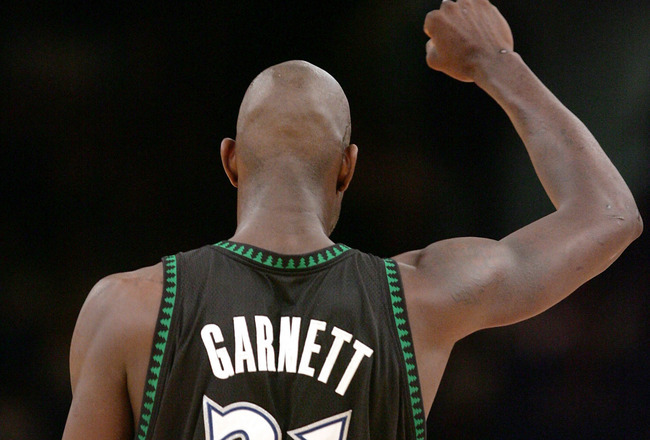 T’Wolves traded a first round pick for 50 games of Thad Young, and then traded Thad so they could have a family reunion with the corpse of KG. Now they may want to extend the contract of said corpse. Flip you continue to amaze us all. Blazers get a key pickup in Afflalo who can provide scoring off the bench, something Portland needs desperately. Only costs them a future first rounder, and likely a pick that will land between 22-30. Nuggets who are now in a rebuild, acquire an asset. All of this brings us to one of the biggest trade deadline clusterf&*%s we’ve ever seen…let’s dive into it. In three-team trade, the Thunder acquire Enes Kanter and Steve Novak from the Jazz for Kendrick Perkins, Grant Jerrett and two draft picks (one from the Pistons); Oklahoma City also receives D.J. Augustin and Kyle Singler from Detroit for Reggie Jackson. Let’s start with the Jazz. Kanter publicly announced he wanted out, Utah obliged and picked up some future draft picks. The Jazz are eager to start the Rudy Gobert era, and losing Kanter probably won’t haunt them. Detroit upgraded the PG position in hopes to squeeze into one of the final playoff spots in the East this season and prepare for the future. Reggie is for sure an upgrade from Augustin, and they could choose to resign him this off-season as an insurance policy if Brandon Jennings recovery is stunted. But that is something Stan Van Gundy will have to attend to later. They desperately want to make the playoffs, that’s why the deal went down. Which brings us to OKC, who is a clear winner in this trade. They discarded an unhappy Reggie Jackson for a low post threat in Kanter, as well as some solid bench pieces in Augustin, Singler, and Novak. This gives OKC a really deep roster which could spur them to a title run this year. Augustin can definitely hold his own as a backup PG; Kanter at times is a very gifted low post scorer and may command double teams on some nights. They also acquire two lights-out three point shooters that could hit some big shots during the playoffs with so much defensive attention constantly going towards Durant and Westbrook. In three-team trade, Suns send Goran and Zoran Dragic to Heat in exchange for Danny Granger and two draft picks, while also acquiring John Salmons from Pelicans; New Orleans gets Norris Cole, Justin Hamilton and Shawne Williams from Miami. Dragic was emphatic over the displeasure he had with the Suns front office, and basically forced Phoenix’s hand to deal him before the deadline passed. Pat Riley savvily stole Dragic for essentially nothing: some fringe NBA players and future first round picks that Riley himself will probably never be in office to select. Miami’s league-worst stable of point guards was their one true weakness now that Hassan Whiteside has emerged as the reincarnation of Alonzo Mourning. Acquiring Dragic, who was second team All-NBA last season, was such a huge acquisition for Miami that for a short 24 hours they perhaps were a dark horse title contender before Chris Bosh’s scary blood clot issue was discovered. But Miami will likely be able to resign Goran during the offseason and could potentially compete in 2016. More importantly, Bosh will be okay. So the Suns acquire more future picks and rid themselves of an unhappy Dragic. They also receive Danny Granger and John Salmons, who both could be waived or just wither away on the bench for the rest of the season. New Orleans get a warm-blooded backup PG in Norris Cole, which is something they need if they are to beat out OKC for the eight spot, though it is highly unlikely. Jrue Holiday’s injury is taking a turn for the worse, and you really can’t have Tyreke Evans playing 40 minutes a night at the point. This was clearly the most shocking trade of the whole deadline. The Bucks imploding their frontcourt and trading their leading scorer during a playoff run is not a strategy many teams subscribe to. The Bucks must have felt that impending restricted free agent Brandon Knight was worth more to the open market this summer than he was to their organization. Milwaukee is not interested in paying a dollar figure potentially between $12-15 million that Knight will command this summer. 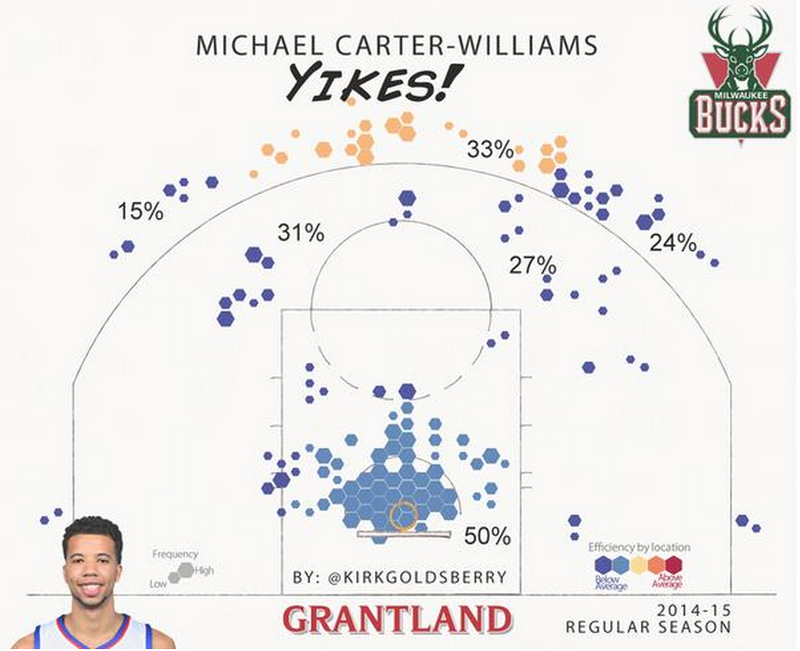 So instead they swap in Michael Carter-Williams who is at least under team control for two more years. The problem is they’re swapping Knight for possibly the worst shooter in the entire league. They do gain a 6’6″ point guard and now have a stable of players who are extremely long and can defend multiple positions. Jason Kidd likely sees a lot of himself in MCW and must feel that he can work with him to fix his woeful jump shot. The Bucks definitely improve on defense, but will now really struggle to score the ball in the halfcourt and don’t really have someone to go to in crunch time. That will really hinder them this season, but going forward with Jabari Parker and the Greek Freak, they will surely be an interesting team to watch. They also acquire Miles Plumlee and Tyler Ennis to add more bodies to an already deep bench. 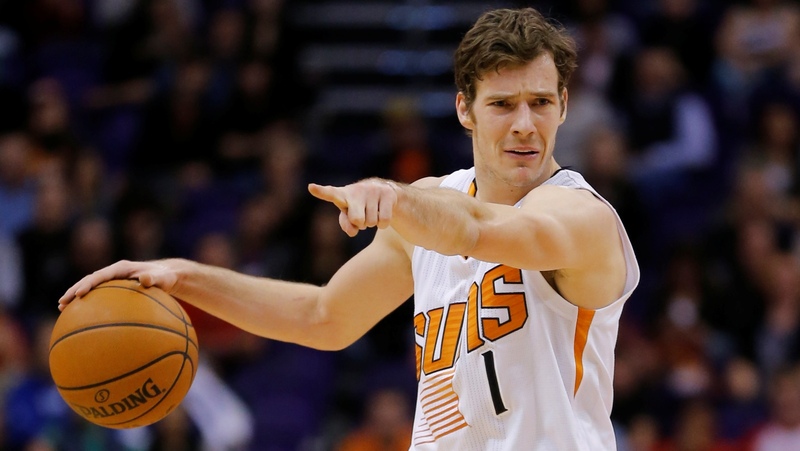 The Suns get a pretty good replacement for Goran Dragic in Brandon Knight. Dragic is much better than Knight, but Knight may fit better into the Suns guard dominated offense. Knight is much more a combo guard than Dragic was and can be a prolific scorer. The duo of Bledsoe and Knight seems like a more natural fit than the Bledsoe and Dragic duo, because Knight can easily transition into the 2 spot. They painted themselves in a corner when they alienated Dragic and were forced to deal him and try and get some value before he became a free agent this summer. Phoenix really screwed this up, but Brandon Knight could pay dividends for the Suns eventually. What won’t pay dividends is the idiotic move to trade the Lakers top five protected pick to Philadelphia. It’s just insane to let that pick go. They must have proposed multiple deals not involving the Lakers pick before they eventually caved to Milwaukee and Philadelphia’s demands. Losing the pick is bad, but losing Dragic and getting nothing return is worse. So they downgraded from Dragic to Knight and let go of an asset that had the potential to land them a future star this summer. Wow. That’s some Flip Saunders-like ineptitude. So here’s what the Sixers and Sam Hinkie were thinking when they dealt away the “current” face of the franchise. The Sixers are not in the business of trying to become average; they’re trying to reach greatness. To the Sixers, MCW was just an average prospect who may have hit his ceiling. They did not view him as a future cog going forward; he plays the deepest position in the entire league and is 100% replaceable in their eyes. Another reason for ditching MCW is that his numbers are inflated because of the run ‘n’ gun style the Sixers play, they have more offensive possessions than most teams. He also constantly has the ball in his hands and only shoots 38% from the field, and 26% from three (I just threw up in my mouth reading those numbers). His numbers are just awful by any standards for a starting guard in this league. The Sixers want to develop a team around stars and MCW is never going to be one. By acquiring the Lakers’ protected pick, they are just giving themselves another opportunity to hit the lottery and draft a potential building block. They don’t really feel like they are taking a huge step back by shedding MCW either. By draft, trade, or free agency, the Sixers are constantly seeking the right opportunity to nab a superstar. Hinkie himself is one of the guys who orchestrated the James Harden trade. That is a type of scenario that they will be looking for moving forward, besides just drafting talent. Remaining flexible by staying way under the salary cap and gathering tons of valuable assets is what will make the Sixers a desired trade partner when a star from another team becomes available. It’s not often those types of draft picks like the Lakers’ become available. It has the potential to be great, and the Sixers were selling high on MCW. Especially considering he’s a PG who can’t shoot and whose only viable trait is his height. All of this trying to acquire and develop around stars is easier said than done, I realize. But what the Sixers want to do is build something that will last not just a few years, but possibly for a decade or longer. The Sixers management is dedicated to building something special and you can begin to see through the mist if you squint really hard. The Hinkie strategy may seem outrageous to many and logical to few, but on Thursday they made the easy decision. We are closing in on the NBA All-Star break and so far this has been a pretty thrilling regular season, especially if you’re only watching the Western Conference. There have already been so many great moments this year. We’ve laughed, we’ve cried, and we’ve seen Clippers owner Steve Ballmer dance to Fergie courtside during a game. So I thought I’d put together a completely biased and objective list of the things I love and hate about each team this year with some refined commentary. The Hawks are the biggest surprise of this season and have been flat out amazing, evidenced by their 19 game win streak. 4/5 of their starters (Teague, Korver, Millsap, Horford) are receiving the bulk of the credit, albeit very well deserved. But their fifth option DeMarre Carroll is the type of glue guy every team needs; he’s scrappy as hell, plays tough defense, and can hit a few timely three pointers. Many of his teammates will be up in New York for the upcoming All-Star game, but without DeMarre the Hawks certainly wouldn’t have the best record in the East. Yes, Mike Budenholzer used to coach for Gregg Popovich. And yes, the Hawks do play a team oriented style of basketball that echoes former Spurs teams. But that’s not a good enough reason to marginalize what the Hawks have done this season by essentially saying they’re only good because they are mimicking the Spurs. If it was that easy every team would hire Gregg Popovich assistants. A-Town down! Coach Stevens is doing his best despite Danny Ainge cleaning house; he has managed to get his team to keep playing hard and is occasionally stealing some games from contending opponents. Instead of just playing young guys who can gain valuable experience, he’s decided to implant Brandon Bass in the starting lineup and is now playing Tayshaun Prince 20 plus minutes a night off the bench. These lineups suggest one of two things; either he’s extremely competitive and hates losing, or he desperately wants to go back to coaching college ball. I’m not mad at Danny for taking a first round pick and Brandan Wright (who was traded for two second round picks) in exchange for Rondo. But what the hell was he waiting for? Good GM’s don’t wait until their greatest asset is at its lowest possible value and then pull the trigger. He couldn’t have possibly seen the Celtics as a playoff contender entering this season, and if he did he gave up on that idea pretty early. Also if I’m a Western Conference team and I see the Mavs got Rondo for basically nothing, I’m genuinely going to be pretty peeved at Danny Ainge for affecting the West playoff race. It’s like when a guy at the bottom of your fantasy league trades one of their best players because they are giving up on the season. Danny Ainge is that guy, and we all hate those guys. That is a phrase I never thought I would say. Honestly, it’s pretty stupid and seems like something a DII college team might do. But for some reason I like that they embraced returning as the Hornets to its fullest extent. When is Time Warner Cable Arena hosting “Baron Davis Night” or “Larry Johnson Night” this year? The Lance “blowing air” meme has been pretty strong, one of the greats if you ask me. But it’s kind of a played idea at this point. Lance is going down in flames as a Hornet and he’s not even starting anymore. Lance for the love of god don’t leave us hanging like this, please come up with some new material. In case you didn’t see, he is taking fan suggestions for his next on court antics. Forward all submissions to ConeyIslandKilla6969@hotmail.com. Pau has been a revelation this year and has really turned the Bulls into a true title contender; if they can stay healthy. It’s rare you see a player like Pau who ages, switches teams, and then seemingly gets better. I also think he’s in some silent game of chicken with his younger brother Marc and doesn’t yet want to relinquish the title of “The Best Gasol”. Pau has given the Bulls something that has been lacking in years past, a reliable post presence who the offense can play through in the halfcourt. With Pau commanding double teams it opens up the offense even more for Derrick Rose and Jimmy Butler. The one downside however is his defensive skill. It’s hard to overlook his lack of defense, but the offense he brings should override the fact that he is a horrific defender. I know Dougie McBucket’s injury has prohibited us from making a solid conclusion about what type of player he’s going to become, but as of now that draft night trade has a bad stench to it. I believe his ceiling as a player is as a good scoring threat off the bench, I’m not sure that warranted trading the 16th (Jusuf Nurkic!) and 19th (Gary Harris) overall picks for him. Due to injury this season the Bulls are forced to play guys like Tony Snell, Kirk Hinrich, and E’twaun Moore major minutes. The team could use an injection talent off the bench not named Nikola Mirotic. Trading for McDermott only gave away the potential to add another young player to the roster. The fact that Cavs owner Dan Gilbert and actual GM David Griffin consult LeBron on all transactions is kind of ridiculous, regardless of the fact that LeBron is the best player on the planet. I feel like he’s always threatening to just opt of out his contract this year, and so David Griffin has to ship off every draft pick he has for the next decade in order to make LeBron happy. Of course trading two first rounders for Timofey Mozgov went down because LeBron doesn’t really care how the Cavs end up in five years. GM LeBron might actually be best for the Cavs anyway, at least he didn’t draft Anthony Bennett. Anything he does from here on out is an upgrade from the previous GM. Attention David Blatt! Kevin Love is more than a three point shooter! Stop sticking him in the corner and do some actual coaching. I hope trading future star Andrew Wiggins for a glorified three point shooter was not the initial plan when they acquired Love. Dirk is the first of his kind, he’s the “Model-T” of European big men who can shoot from deep and who also have post skills. He has made the Mavs relevant for almost two decades, including this season, and I rarely show affection to anything German so this declaration has some weight to it. Even after all the additions of Rajon Rondo, Chandler Parsons, and Tyson Chandler, if the Mavericks make any noise in the playoffs it will undoubtedly be because of Dirk and that silky smooth jumper. Mark, please yell at a ref or accost the league in some way and get fined. We want the old Cubes! Make it rain in the commissioner’s office and let Adam Silver know that those hundred dollar bills are just “fun coupons” and you won’t ever stop being you. When you’re a rookie and you’re smack talking and jawing at Kobe Bryant, DeMarcus Cousins, and Marc Gasol without any level respect for those guys who are more accomplished than you’ll likely ever be; that takes some guts and deserves a tip of the cap. Even though it’s stupid and unwarranted, I love him for that. I’m making odds on who the first guy to throw a punch at Jusuf in response is. Highest odds are DeMarcus Cousins (revenge) 2-1, JaVale McGee (accidentally) 9-2, and if you’re looking for longer odds Ron Artest (psychopath) 5000-1. Really Ty? Two DUI’s? C’mon dawg you make millions of dollars a year, shell out a couple bucks for an Uber or call Danilo Gallinari to come pick you up, he’s probably available. Professional athletes receiving DUI’s has almost become a regularity; how teams are not more proactive about this is outrageous. I realize the large majority of this problem is the personal responsibility of the athlete, but teams need to babysit these guys or have harsher penalties. Unfortunately it’s probably going to take someone’s untimely death before the problem is finally addressed further. Sorry that I had to be a little morose to prove a point. It definitely must have been a tough sell for SVG to march into the owner’s office and say “Hey, so I want to cut Josh even though we still owe him $26 million. You cool with that?” If this move didn’t work and the Pistons ended up worse, I’m not sure how Stan Van would’ve survived. This is the ultimate case of addition by subtraction. I can’t even recall a similar situation where the release of one player created such an upturn in wins. Maybe when Brad Pitt traded Carlos Pena in “Moneyball”? As if sports in Detroit couldn’t get worse. We’re still relatively fresh off the NFL refs screwing over the Lions. The Pistons uptick and winning ways were a silver lining to that horrific Lions loss. Jennings going down for the season is really unfortunate because the Pistons were once again becoming a great team to watch. Brandon Jennings’ game was flourishing without Josh Smith on the floor dominating the ball, and he was directly contributing to the poor man’s “twin towers” Greg Monroe and Andre Drummond wreaking havoc on opponents. At this point, it’s hard not to feel bad for the city of Detroit. The kid is straight fire. Every time he launches a three and it doesn’t go in I think my eyes are playing a trick on me. Also he scored 37 points in one freakin’ quarter. I’ve played rec league basketball for over 15 years and I’ve yet to eclipse 30 points in an entire game. Just for fun, here are a couple names of players drafted over Klay Thompson: Derrick Williams, Jan Vesely, Bismack Biyombo, Jimmer Fredette. Those guys could go 4 vs. 1 with Klay and they’d lose. The Warriors are a really exciting team to root for, but I’m afraid without a healthy Andrew Bogut they won’t have a shot at the title. It’s entirely possible they can win without him, but it will be a hell of a lot easier with him in the on the hardwood. They need his defensive presence against dominant frontcourt teams like the Grizzlies; his defense will need to hold teams close during the few games that Steph and Klay go cold. What Are The Cavs Doing? Look, at first glance, the last couple moves the Cleveland Cavs have reportedly made look sound. On Monday, they flipped Dion Waiters, who Kyrie Irving almost definitely hates, for JR Smith, who has at least proven he can contribute to solid teams. In that move, they added potentially good wing defender Iman Shumpert and a late first round pick from Oklahoma City. Still, in doing so, they put themselves in an even tougher position salary cap-wise if Smith exercises his $6.4 million player option (pretty likely) and they try to retain restricted free agent Iman Shumpert. Grizzlies pick is protected two ways (1-5, 15-30) for the next two years. Buuuuut only top-five protected they year after that. This is a massive haul for Denver. The Nuggets had recently begun giving the talented Jusuf Nurkic minutes over Mozgov anyway and have no chance at making the playoffs. Nurkic looks like a keeper, and the two picks will help them restock their roster. For the Cavs, the trade is quite the risk. Some combination of Dan Gilbert, GM David Griffin, David Blatt (who coached Mozgov on Team Russia), and LeBron have decided that the need for a rim protecting center in 2015 is more important than flexibility and young talent in the future. This is a notable departure from the patience message that LeBron and Blatt have preached from the start. In James’ homecoming letter, he cautioned that this was a long process and he wanted to build something long lasting. Yet every move made by Cleveland screams out that they need to win NOW. In October, Cleveland gave the oft-injured 32 year old Anderson Varejao an extension that guaranteed him two years and $20 million. He tore his achilles in December and is out for the season once again. He’s only played more than 31 games in one season (2013-14) since 2009-10. It’s hard to blame the Cavaliers with the previously immortal LeBron missing extended time for the first time in his career after not looking like himself early in the season. But if LeBron’s body is breaking down they have far bigger problems than winning a title this season. It seems more likely that the Cavs simply want to win now far more than they’ve let on. But do they even have a roster capable of doing so? While Mozgov adds some needed rim protection, the Cavs are still two or three players short of a full contender’s rotation. Furthermore, their defense has been a disaster that one solid defensive center can’t fix by himself. Kevin Love has looked disinterested and the James we saw early on wasn’t playing sound defense at all. When you consider all of the injuries the Cavs have already faced, it’s extremely tough to assume full health for them come playoff time. It seems LeBron James returning to Cleveland wasn’t all they needed to return to contention. The role of owner Micky Arison, Hall of Fame executive Pat Riley and the underrated Erik Spoelstra were all integral parts of James’ success in Miami. While Cleveland undoubtedly has a playoff roster and the hint of a championship core, it’s utter lack of competent front office and ownership personnel is clearer than ever. The Bulls started off the New Year right by grinding out a win against a very physical Denver Nuggets team and improving to 23-10 and 9-6 at home. It was Derrick’s late-game heroics that helped seal the comeback victory after the Nuggets coaches reportedly were telling their players how to defend Rose, forcing him into a jumper, given the issues he’s had shooting the ball over the past couple games (9-49 combining the games against Indiana, Brooklyn, and the first three quarters against Denver). But in true MVP form, Rose came through in the fourth quarter, shooting 5-11 and two free throws. He one-upped the Denver coaching staff by hitting a difficult shot in isolation to put the Bulls up 102-97, which all-but secured victory, save for the foul-and-free-throw game. It was an exciting game that could have gotten away from the Bulls, down 53-42 at the half, as the Bulls were flat early, allowing Lawson to penetrate, not boxing out the Manimal (here’s a slam from their first meeting), and allowing the Nuggets second chance opportunities. But Pau’s nine blocks (a career high in his 14th year), and the team’s 18 blocks (a franchise record) helped keep the Bulls within striking distance. The ball movement improved as the game went on, and the Bulls started hitting the 3-ball, one from Derrick and one from Hinrich, as both capped big momentum swings. Niko Suave demonstrated his versatility in the paint with a nice lefty hook shot when the game was getting away from the Bulls. He hasn’t been getting open for big shots the last few games, but with his mature all-around game, he doesn’t always need to. With Dunleavy hurt and Jimmy needing a breather, Thibs had to go small and put out a three-guard lineup of Rose, Brooks, and Hinrich, which we haven’t seen yet this season. Noah has a different approach to stats. When told that the Bulls set a franchise record 18 blocks, Jo retorted with heavy deadpan: “(Bleeping) awesome. Oh my god, it’s amazing. Best feeling ever.” Gotta love Jo. The Bulls stepped up their defense along with the blocks, created turnovers, and ran the floor, as Rose had a dime of an alley-oop in transition to Butler, who jammed it home to a raucous United Center late in the 4th quarter, extending the lead 96-90 with three minutes to play. Jimmy got his shot back after his own woes, and finished with an impressive line of 26 points, eight rebounds, eight assists. The Bulls did have another miscommunication in a late-game situation, allowing Faried an easy slam. Luckily it wasn’t enough to stem the tide. Thibs is sticking to closing out with Noah and Taj, as Pau was removed from the game with 8:12 to go, only to return for the final 11 seconds after Gibson fouled out. With four back-to-backs in the month of January, it’ll be a grind for the Bulls, but if they can keep logging victories despite not having their A-game, they’ll certainly be dangerous when they’re firing on all cylinders, and we’ve seen glimpses of that this season. As we near the All-Star break, this is where we’ll look for the Bulls to come into form. The Bulls take on Boston at the UC tomorrow night. The ESPN Trade Machine has been a great innovation for avid basketball fans like us. If only real trades were able to go down so easily and without everyone’s consent like in your 2K franchise. I tried my best to come up with 15 realistic trades with all 30 teams involved. So when I say “go” everybody grab a dance partner and make a trade…go! If you missed Part One of the Diaries, check them out here. As good as Tony Wroten has performed in a Sixers uniform, the fact remains that no one player is safe on a team that is winless through its first 12 games. If you ask Sam Hinkie to weigh Tony Wroten against a second round pick that is likely to be in the top 38, he’s going to choose the draft pick every time. It’s nothing against Wroten; Hinkie is all about collecting future assets. The Lakers probably shouldn’t deal this pick because it seems like this year’s draft is going to be a relatively deep one. Lin and Nash are out the door this summer and Wroten has proven to be a valuable commodity. He’s explosive, can get to the basket at will, and might be a player who can build on his recent success. If the Lakers figure Wroten is better than anyone they’ll get at the top of second round, it makes perfect sense to pull the trigger. Tony Wroten is an obvious upgrade at PG compared to whatever the Lakers have lined up for 2015. It’s been no secret that Andre Iguodala is unhappy with Steve Kerr and his new role off the bench for the Warriors. If the Warriors really want to make a commitment to Harrison Barnes, trading Andre Iguodala would be a good indication. It may not be the most basketball savvy move for Golden State, but their payroll could use the relief. They receive the expiring deals of Landry Fields and Chuck Hayes, which would benefit them in the offseason. They’ve already committed a ton to David Lee, Andrew Bogut, Klay Thompson, and Steph Curry, so this type of “salary shedding” deal is necessary for the Warriors. Messing with your teams chemistry while you’re winning isn’t generally a good thing to do, but adding Iguodala for almost nothing makes the Raptors a legit contender to make the Eastern Conference Finals. Terrence Ross is not yet the model of consistency at the SF position, and adding Iguodala, an all-around player and distributor, will help DeMar DeRozan, Kyle Lowry, and Jonas Valanciunas. In this scenario Memphis is preparing for life after Marc Gasol. The smart money has Gasol leaving for a huge deal elsewhere (MSG?) in the offseason. Utah has an excess of big men, which is a very valuable commodity these days. Utah cautiously chooses to keep Enes Kanter and Derrick Favors over Gobert. In return, the Jazz gets a protected first rounder and the expiring contract of Kosta Koufos. Rudy Gobert is hardly a finished product, but Memphis could do worse on short notice. Milwaukee has certainly over performed thus far into the season. The Bucks really don’t rely that heavily on Jared Dudley as is, but now with players like Khris Middleton, Jabari Parker, and Giannis Antetokounmpo, the Greek Freak, emerging even more, it’s harder to justify giving extended minutes to Jared Dudley. Of course veteran leadership is important for a team like the Bucks, but who actually believes that Dudley is an integral part of this Bucks team? New Orleans is a rising team in the West but their second unit could use some improvements. They really lack depth overall when Jrue Holiday, Tyreke Evans, and “the Brow” leave the court. Dudley isn’t the most prolific scorer, but he can at least give the Pelicans a little spark when the starters are on the bench. Right now the Clippers backup point guard is Jordan Farmar. Farmar isn’t the player he used to be when he played with the Lakers championship teams. A bonafide contender like the Clippers should make finding a replacement for Farmar a top priority. At this point, the Nuggets will probably be selling most of their assets, and luckily for Lob City, Nate Robinson is on the block. Besides Jamal Crawford, there isn’t much scoring out there for the Clippers second unit. Knicks fans will begin to pine for the old days when Crawford and Nate were wearing blue and orange. There will be more than enough buckets out there for the two of them when CP3 and JJ Redick leave the game. It’s entirely possible that Iman Shumpert is not part of the Knicks’ future. Shump is a talented young player but who knows if Phil Jackson has eyes on other potential talent at the two guard spot in free agency. They receive Perkins’ expiring contract as well as a future first rounder from OKC. No, you did not read that incorrectly: for once the Knicks would be receiving a first rounder instead of giving one away. For the Thunder, this could be a last ditch effort at trying to keep Kevin Durant from fleeing to DC. Russell Westbrook, Durant, Serge Ibaka, Shumpert and Steven Adams could contend for the title. The frontcourt in Orlando is quickly getting very crowded. The Magic drafted Aaron Gordon fourth overall this year and have big plans for him. They also signed Channing Frye to a four year contract (a questionable signing to say the least) and currently have other bigs on the roster like Kyle O’Quinn and Nik Vucevic and wings in Tobias Harris and Mo Harkless who can play the four as well. The Spurs are the team that would recognize Nicholson withering away on the Orlando bench. This doesn’t really affect Tim Duncan, since he’s immortal and will probably continue playing well into his 50s. But honestly, you’d have to think he only has one or two years left in the tank. Nicholson is kind of a speculative, buy low prospect for the Spurs. They’ve done it before with guys like Danny Green and Boris Diaw. No doubt, if Nicholson were to dress in a Spurs uniform he’d be a solid contributor. Meanwhile, the Magic grab another future asset. Hey, these guys are still getting paid to be in the NBA! Finally we’ve reached the end. Sorry that this trade is anticlimactic but those are the breaks of trying to force a deal with every single NBA squad. Some of these trades are bound to be duds. Follow @jeff_berest for more of my NBA musings and @DRosesAndThorns for more Bulls and NBA coverage.